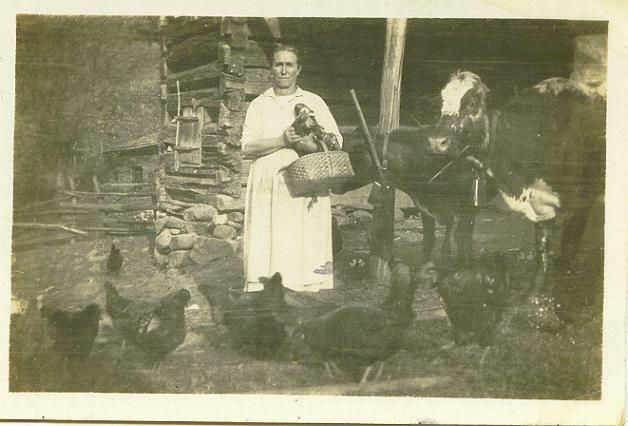 Comments: Annie Cagle (Nee: Clark) | Pine Log Ga USA | 1921-1940 | Comments: This photo is of Annie Clark Cagle born in Bryson City N.C. born 2/28/1876 died in Pine Log Ga. in 4/23/1954 . She was married to Henry Lee Cagle jr. born 11/4/1872 in Haywood N.C. died in Pine Log Ga. 12/3/1937 . Annie and Henry were Married 7/23/1891 in Bryson City N.C. the photo was taken at the old home place in Bryson City N.C. Where the old house stood is now part of the Great Smokey Mt. Park you can still see the root cellar pit where apples and can goods were stored.